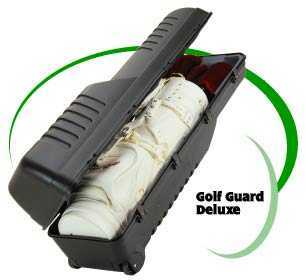 The Golf Guard® Deluxe offers a few additional "extras" to make your golfing or traveling experience a little more pleasurable. 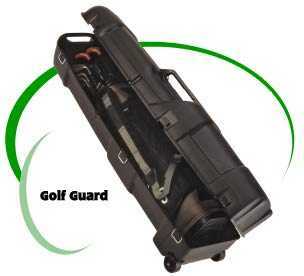 For example, its larger interior holds bags up to 11 inches in diameter and drivers up to 46 inches long, and its foam-padded to protect club heads; and it has lockable latches with protecting ribs for extra security. The deluxe model also includes a new wheel design that’s extra tough on the course or at the airport (this case is airline approved too!). Because sometimes it’s rough on the way to the course™, the original Golf Guard® and the Golf Guard® Deluxe make traveling a lot easier! Hallson Golf All rights reserved.